The SMX-30 was engineered to be the ultimate video microphone with outstanding audio quality, appealing design, ergonomic form factor, and all of the functional features one expects in a top-of-the-line, camera-mounted microphone. Stereo or Mono? Why Choose? If you only have the budget to buy one microphone for your camera, why should you have to choose between mono or stereo? The SMX-30 is stereo/mono switchable, so you don’t have to. Housed inside an innovative casing, the SMX-30 is actually two microphones packaged into one. The stereo microphone is positioned at the top and consists of 2 cardioid polar pattern microphone elements spaced apart at a 120º angle for capturing a natural sounding stereo image. The mono microphone uses a super-cardioid polar pattern to focus on sound in front of the camera and is equipped with the same high-quality element as Azden’s SGM-250 shotgun microphone to record broadcast quality sound. The audio controls on DSLR cameras are limited, if they exist at all. And DSLRs are notoriously known to have low-quality microphone preamps that add noise to the video soundtrack when the gain is turned up. 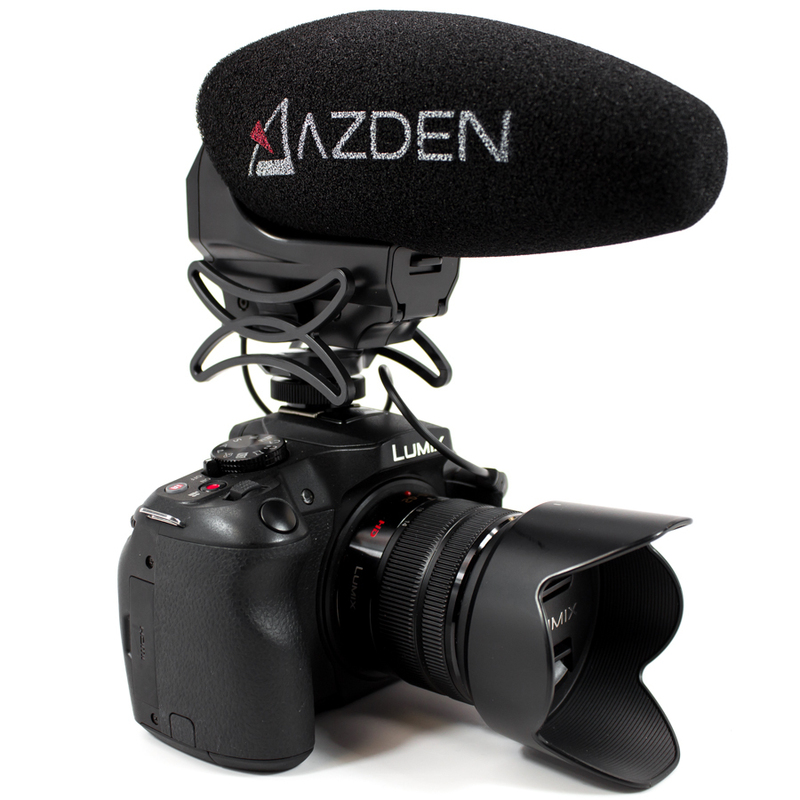 That’s why Azden designed the SMX-30 with a +20dB gain booster; so you can get a strong, clean audio signal into your camera, minimizing the need to turn up the noisy preamp. Also included is a -10dB pad to protect against distortion when recording in loud environments such as live concerts and motorsport events. The SMX-30 has a wide frequency response ranging from 40Hz to 20kHz, so the audio you capture will sound full and natural. Additionally, a low-cut filter switch is included for reducing the level of low frequencies below 120Hz, which is especially useful for mitigating noise caused by air conditioners, wind and traffic. The SMX-30 is powered by two AA batteries; a lower cost option than the 9V battery that is used in some competitor microphones. The SMX-30 can achieve 24 hours of operation with a single set of batteries with absolutely no degradation of sound quality. The battery indicator LED light lets you know when it’s time to change batteries with up to a 1 hour warning. Maximize battery life by using the unique “Auto” power setting. When set to Auto, the SMX-30 can detect when a camera is on and will automatically power on and off with the camera (requires a mic input that provides plug-in power). Ever leave your microphone on by accident to discover that the batteries are dead the next time you try to use it? Eliminate that possibility by always leaving the SMX-30 in “Auto” mode. Integrated into the design of the SMX-30 is a custom made, shock absorbing shoe mount to isolate the microphone from camera motor and handling noise. The mount is designed to fit the standard camera shoe and comes with a ¼”-20 thread at the bottom for mounting to boom poles and other camera accessories.